Our Moderate rooms are approximately 16 square meters with an ample work space and a cozy bed (at least 120 cm). Rooms in the original section have high ceilings, deep window niches and beautifully restored windows. In the newly built section the rooms recieve lovely natural light through floor-to-ceiling windows. Bathrooms are spacious with modern amenities and a hairdryer. All rooms have LCD TV. Standard double room offers a well-planned, approx. 20 m2, with work area, good storage and a comfortable double bed. The rooms in the old part of the hotel have high ceilings, deep window recesses and beautiful old windows which give the rooms wonderful character and feeling. In the new section of the hotel, the rooms get beautiful natural light from the large windows. All rooms have designer furniture from B&B ITALIA and lamps from FLOS. All rooms are equipped with LCD TV. The bathrooms are spacious with modern materials, some with shower and others with a bathtub. A hair dryer is provided in all. The standard rooms are approx. 20 m2 with work area, good storage and two separate single beds. The rooms in the old part of the hotel have high ceilings, deep window recesses and beautiful old windows which give the rooms wonderful character and feeling. The rooms in the new section get beautiful natural light from the large windows. All rooms have designer furniture from B&B ITALIA and lamps from FLOS. All rooms are equipped with LCD TV. The bathrooms are spacious with modern materials, some with shower and others with a bathtub. A hair dryer is provided in all. All superior rooms are over 30 m2 with fantastic high ceilings and space, furnished with designer furniture from Italian B & B ITALIA and lamps from FLOS. All rooms have a large work and living area and are equipped with down duvets and pillows, telephone and an LCD TV. The superior rooms in the old part of the hotel all have high ceilings, deep window recesses and beautiful old windows which give the rooms wonderful character and feeling. In the new section of the hotel, the rooms get beautiful natural light from the panoramic windows. Our deluxe double rooms (40 sqm) have a lounge area and workspace. The rooms feature designer furniture by B&B Italia and FLOS lamps. Facilities include a Nespresso machine, telephone, LCD TV and a sofa bed, as well as bathrobes and slippers. The Clarion Hotel Post has four suites where you can enjoy a truly luxurious stay. The suites are spacious and airy, with a separate living area and generous workspace. The walls are adorned with art by Gothenburg artist, Jens Fenge. Suites feature contemporary design, without compromising on practical requirements. Bathrobes and slippers are provided for use during your stay. 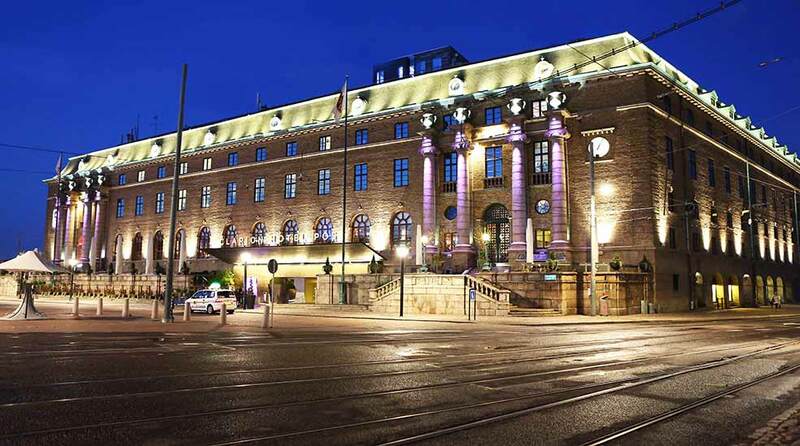 Our suites have views of Gothenburg's bustling city centre.